National safety is the foundation of a prosperous country, and a strict and complete surveillance system can help the first line army to keep the sensitive military areas in safe. Surveon Military Solutions has deployed in war ships around the globe, providing advanced and reliable performance for military use, ensuring the safety of citizen, soldiers and national property. Military surveillance is required to cover vast areas of land and sea. To do this effectively, you must utilize various and reliable video analytics to remain one step ahead of constantly evolving challenges. The military must need a solution which can provide sufficient reliability for 24/7 operations. From camera, NVR to VMS, each part of system needs to perform well, regardless of different kinds of environment. The complicated integration and verification tasks not only consume many invisible resources, but also contain potential risks of integration. As any part of system could be the reason that makes the system fail, it takes efforts and time to find out the root cause, let alone if the system is composed of products from different suppliers. Surveon cameras provide stable operation in diverse environments with both indoor and outdoor and support vandal resistant, weatherproof, −40°C (−40°F) to 50°C (122°F) wide temperature and 90%+ humidity. With advanced features such as P-iris and WDR, the cameras can also provide high image quality, making it become ideal solutions for military projects. Built-in with enterprise RAID protection, Surveon NVR ensures 365+ days 24/7 non-stop recording with reliability to ensure the safety of citizen, soldiers and national property. Surveon is committed to meeting and exceeding the exacting quality demands of our security partners. Each Surveon product is designed and manufactured with industrial-grade components, circuit, tooling, integration, and validation abilities as well as ISO9001/14001 certified production capabilities, its quality can be proved by the extremely low RMA rate. 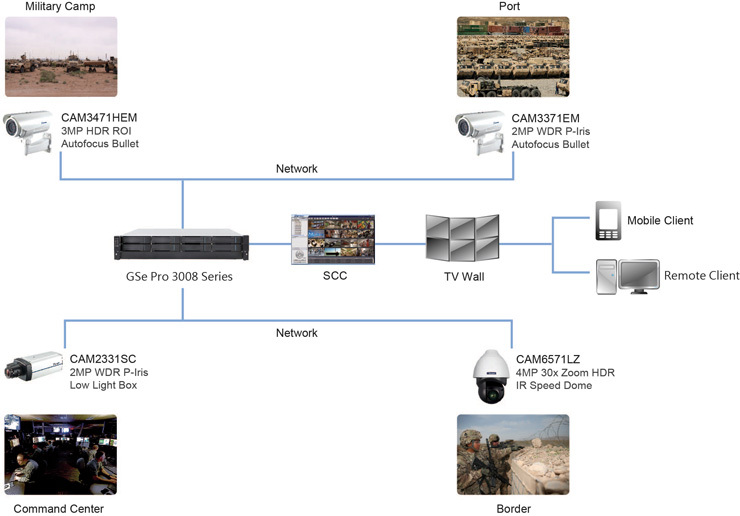 Featuring functions such as foreign and missing object detection, forbidden area, intrusion detection and camera tampering detection, Surveon NVRs are built-in 12 video analytics. These real-time video analytics help increase the situational awareness of monitoring personnel, and increase surveillance efficiency. Surveon cameras are fully compatible with major 3rd party VMS such as Milestone VMS, saving the efforts and time to integrate different brands of products. Besides, many 3rd party camera providers have been fully tested for compatibility with Surveon NVR systems, giving partners a broad range of solution selections for their projects.